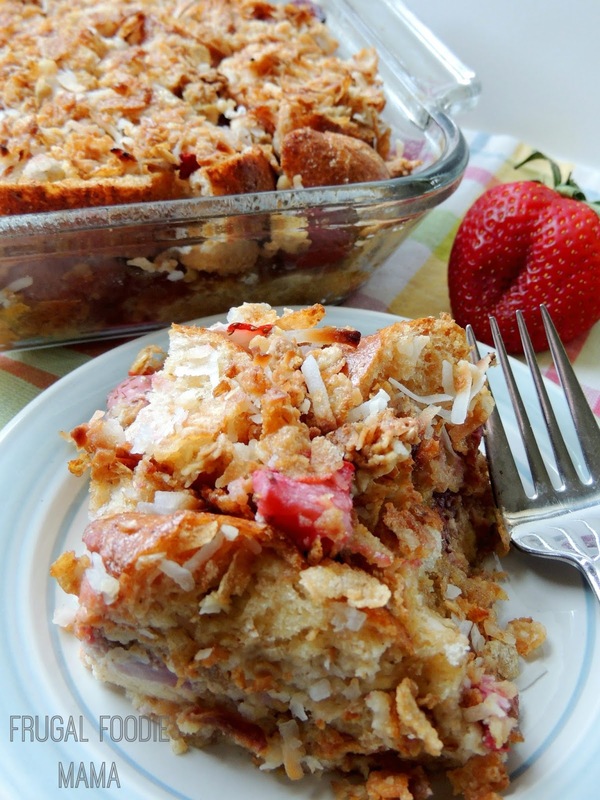 So, today I am sharing with you all this Strawberry-Coconut Crunch Layered French Toast perfect for whipping up for Easter morning (or any spring weekend morning!). Spray an 11x9 inch baking pan with cooking spray. Place half the french loaf pieces into the bottom of the pan. 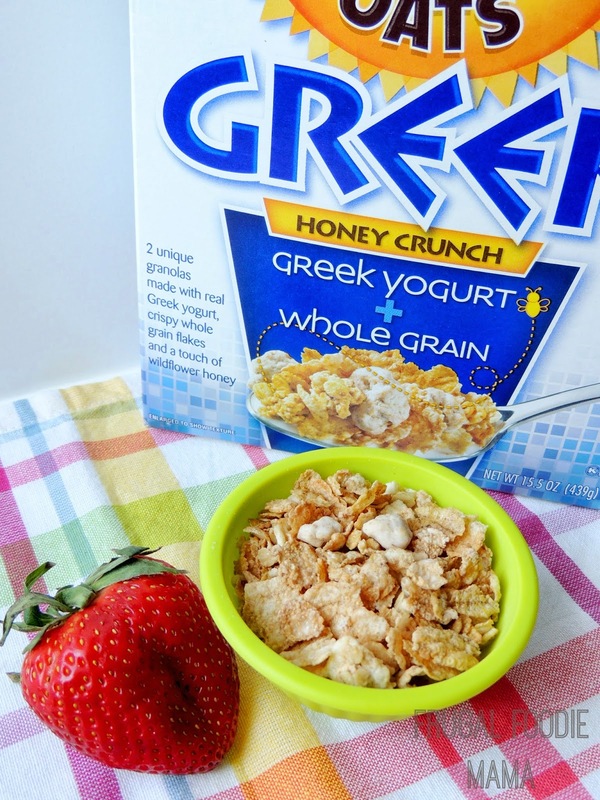 Cover this layer of bread chunks with half of the strawberry slices & 1 cup of the Post Honey Bunches of Oats Greek Honey Crunch cereal. Cover the strawberries & cereal with the remaining bread chunks. 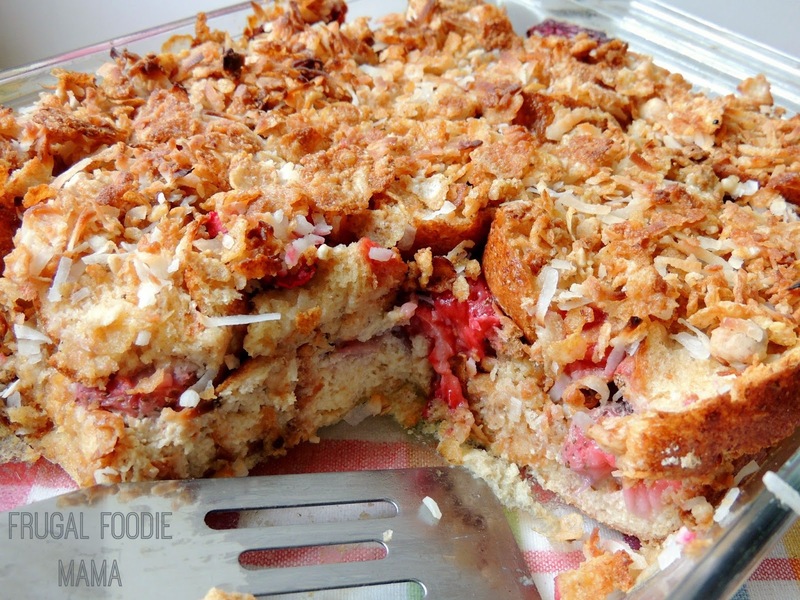 Top this layer of bread chunks with the remaining strawberries. Set aside. In a large mixing bowl, whisk together the eggs, vanilla, evaporated milk, coconut milk, coconut Greek yogurt, & sugar. Pour this mixture evenly over top of the layered bread chunks in the baking pan. Press down the bread chunks to make sure all pieces are being soaked in the liquid. Cover tightly with plastic wrap and refrigerate overnight. Simply preheat your oven to 350 degrees the next morning. 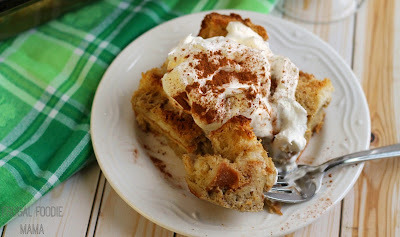 Take your layered french toast out of the fridge. 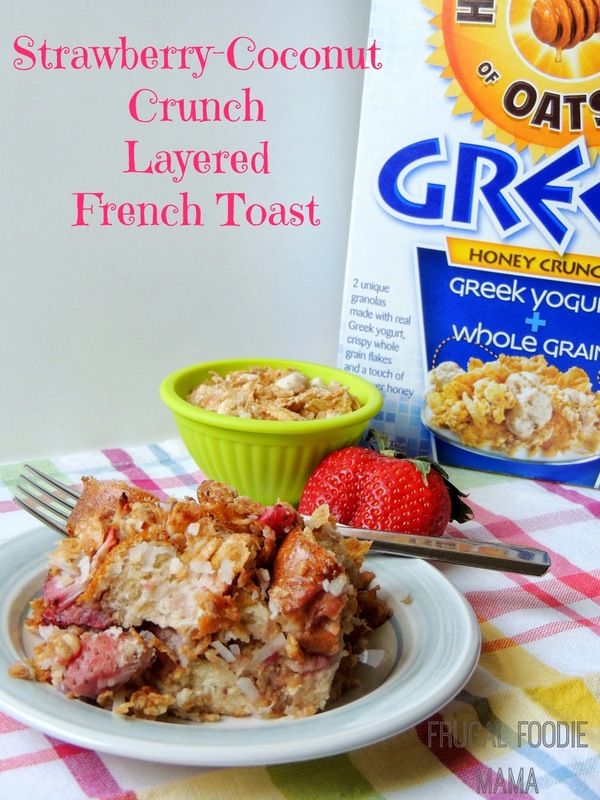 Evenly top the layered french toast with the coconut/cereal mixture. Cover the casserole loosely with foil. Bake at 350 for 40-45 minutes. Remove the foil during the last 10-15 minutes to allow the coconut to to become golden brown. 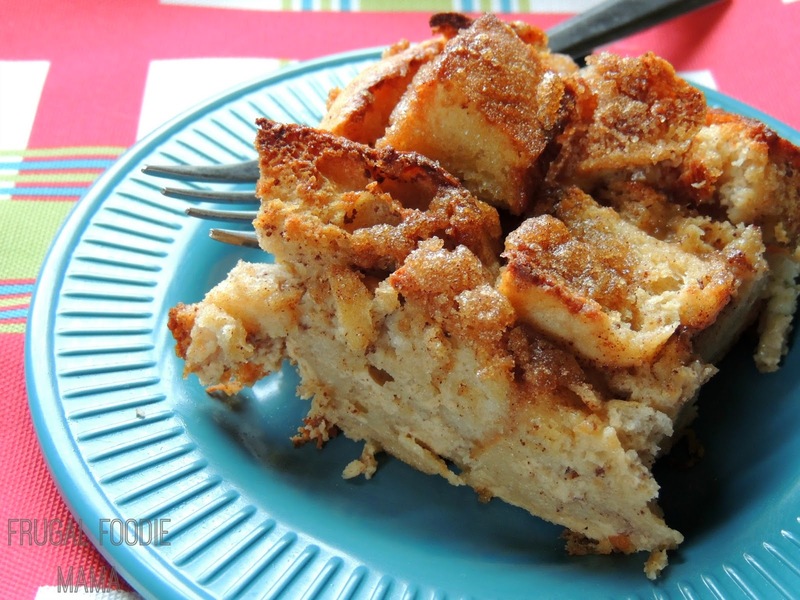 The layered french toast is done when the edges are golden brown and the center is set. Allow to cool to warm and then cut into 9-12 equal pieces and serve. Store any leftovers covered in the fridge for up to 3 days. One of my goals this year is to start an Easter brunch with my family. I have always loved the idea of an Easter brunch for just the four of us before we head out later for the big family dinner. I want to have a few dishes to serve for brunch that morning, but I also don't want to be tied down in the kitchen for a couple of hours. 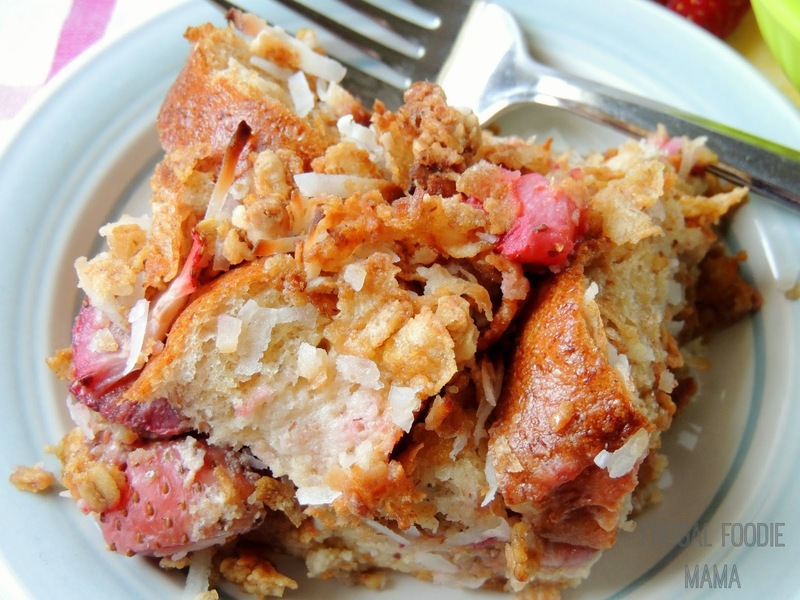 That is why I love this Strawberry-Coconut Crunch Layered French Toast! Most of the assembly happens the night before. I just have to add the topping and pop it in the oven the next morning, leaving me free to whip up a couple of more Easter brunch dishes and to spend more time with my husband and my kiddos Easter morning. Do you host or attend an Easter brunch each year? What is your favorite brunch dish to serve? 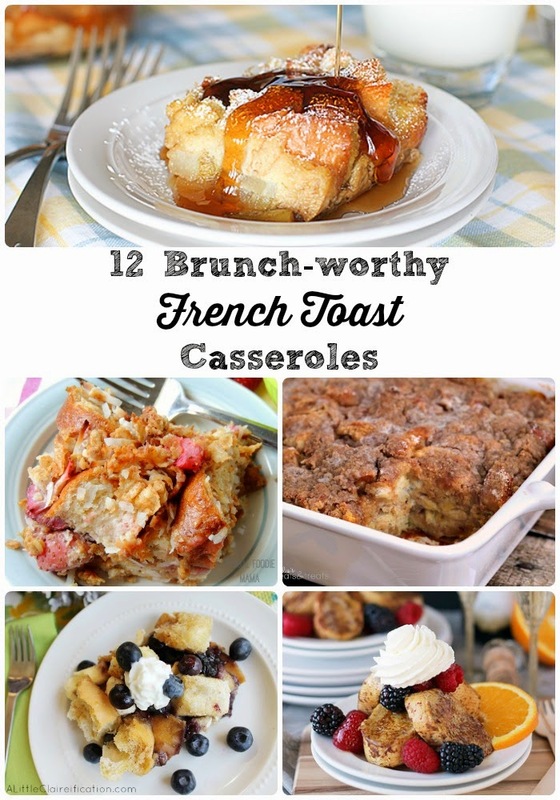 Follow Carrie (Frugal Foodie Mama)'s board Brunching It on Pinterest. I love hearing from you all! I read each and every comment & almost always respond if you are not a no-reply commenter. :) Please check your settings & make sure you have a public email connected to your account so I can connect with you better. Looking for something? Type below to start searching! Carrie Robinson is a participant in the Amazon Services LLC Associates Program, an affiliate advertising program designed to provide a means for sites to earn advertising fees by advertising and linking to [Frugal Foodie Mama, amazon.com, or endless.com, MYHABIT.com, SmallParts.com, or AmazonWireless.com)].